As our vacation in the Pacific Northwest wound down, yesterday Kay and I took a day trip to Victoria, on Vancouver Island. 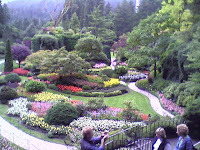 The highlight was a few hours spent at Buchart Gardens. And, of course, that's when I really regretted leaving our camera behind. We used the cameras built into our cell phones (for example, the picture at left), but that's no substitute for what we could have gotten. If only I'd paid more attention when preparing for the trip. I guess that's a metaphor for writers. Every day we encounter situations and people that may someday be a part of a scene we're writing, even play a major role in a novel. All too often we pass them by without a thought. Maybe we'd be better served if we paid more attention, committing details to memory. Then we'd have clearer pictures to use as the basis for what we're writing. I love the following quote from Elizabeth Barrett Browning so much that I often use it in my signature block. I commend it to you as you go through life. Look around you for evidences of God's handiwork. Pay attention. Don't forget to open the camera of your mind. And have a great Labor Day weekend. "Earth's crammed with heaven, And every common bush aflame with God. But only those who see take off their shoes. The rest sit around and pluck blackberries." Continuing our "tourist" thing, today Kay and I went to the Museum of Flight, just outside Seattle. It's a fascinating collection of exhibits, and we truly enjoyed it. During our visit, we were able to walk through a Concorde, and I remarked that the seats didn't look that much different than the ones in coach class on most commercial flights. Kay reminded me that these passengers were only in the air for less than three hours. No need to lean back and try to sleep. Through the magic of modern science, time was compressed for them. Taking into account the various time zones, they could arrive before they left! Wow. Today, agent Rachelle Gardner's blog deals with the importance of an author's letting some time pass when editing a submission. Almost always, this results in an improved product, whether a query, a proposal, or a full manuscript. Without the perspective of elapsed time, there's a too-real possibility that we'll send something before it's ready. Gallo Wine used to have a slogan: We will sell no wine before its time. Writers would do well to observe a slightly edited rule: We will send no line before its time. I must confess that I've been guilty on several occasions of sending something off in a rush, anxious for an agent or editor to praise it and rush it on its way toward publication. But time and experience have shown me that this isn't the best course. I've learned--the hard way, of course--that Rachelle's right. Give it some time. No need to put our manuscript on the Concorde. Coach class will do just fine. I recall days in college when I could pull an all-nighter in preparation for a big exam and never even yawn the next day. These episodes were even more frequent in medical school, but as long as the coffee held out I was fine. During my internship, I worked six weeks in the Emergency Room of Parkland Hospital in a schedule of on for thirty-six hours, off for twelve. It was tough, but I was young and resilient and I survived. But those days are long gone. I need my rest. Especially now. Kay and I moved a week ago. The days that followed were filled with people parading through the house to hook up phone lines and internet service, check out the air conditioning system, rekey the door locks...you name it. We bumped into boxes at every turn. Kay and I took turns asking, "Do you remember which box that was in?" --often with negative results. And six days after the move, we took off for this previously scheduled vacation. We've been in Seattle, the Emerald City, for two days now, and despite the presence of a Starbucks on every corner (I kid you not), we're still sleepy. But we're getting there. And we're doing a bit of exploring. Yesterday we managed to make it to SafeCo Field to watch a game between the only two teams in the American League West that are worse than our Texas Rangers. The game wasn't much, but the foot-long hot dogs were excellent, the field was a magnificent sight, and the smell of the garlic fries dropped our blood pressures twenty points. 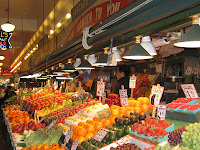 Today we trekked down to Pike Place Market, a place where stalls selling fresh fish co-exist with merchants displaying wonderful produce, magnificent flowers, and lots of souvenirs. We enjoyed a crabmeat-salad sandwich for lunch while watching the ferries heading out of the bay. In other words, we played tourist. I have my laptop with me, but I won't be writing this week. If I see something that might be useful in a future scene, I'll jot down some notes. But otherwise, I'm just letting my mind rest. Stephen Covey calls this "sharpening the saw." I think it's a great idea. Right now, my saw is still pretty dull, so I'm going to shut this thing down and get some rest. In the hustle and bustle of moving, I'd almost forgotten that my devotional was published in the latest issue of Upper Room Devotional Guide. Then I began receiving emails about it. It's humbling to realize that my words--actually, the words God gave me--were read in eleven languages by millions of people in multiple countries around the world. The meditations I've had published in this devotional guide have reached more readers than I could ever hope to touch with my more "conventional" efforts, either fiction or non-fiction. It's a privilege to have that opportunity. Sorry for my extended absence from the blog-o-sphere. We're now in our new home, with phone service and internet access once more. Of course, we sometimes get lost among the labyrinth of boxes, but we're happy to be here. We'll be on vacation for a week, although I may have the opportunity to post sometime next week. But I promise I'll be back online by Labor Day, ready to share my thoughts on writing and life in general. Thanks for your patience. Tomorrow we drive forty minutes to the north and sign the papers for our new house. The moving van comes Monday morning. Our internet connection goes down Monday and won't be re-connected for a couple of days. I'll be back online with another post as soon as possible. Meanwhile, you'll just have to be content with watching the Olympics or reading some of the excellent posts on the blogs listed on my sidebar. We're packing...and packing...and packing. Admittedly, Kay is doing most of it, while my job seems to be cleaning out almost thirty years' worth of accumulated "stuff." My recent task was going through the loaded bookshelves in my office, sorting out what will be moved and what will be given away or discarded. When I look at the result, I realize that, in a way, my bookshelf defines me. For over a third of a century, I was a physician in active practice. Along the way, I became more than a clinician (although that was always a very important part of my life). I wrote and edited textbooks, published over a hundred papers in professional journals, and taught all over the world. But I've been retired from that for over six years, and little by little the teaching and medical writing have diminished until now I probably teach once or twice a year. I still keep up with the field, but it's not the major part of my life it once was. In preparing for this move, I took several boxes of textbooks to the library at the medical school where I was a professor for a decade. I kept some of the most important works in my bookshelves, but now they're definitely in the minority. Now most of the books that remain in my bookshelves are books on writing. You've seen me blog about most of them, so I won't list them again here (although it might be a subject for a future posting). The point is that now I'm a writer. That's right, I can say it. I've had one non-fiction book published, my agent is extremely optimistic about the chances of getting my first novel accepted, and quite a bit of my work has appeared in several periodicals. I'm a writer. And my bookshelves show it. I guess our books don't totally define us--most of us don't have a huge library on how to be a dad or mother, a husband or wife, a member of the community--but they do show where our interests lie. What do your bookshelves say about you? I can't recall who said, "I only have two hands, and I'm busy wringing them," but they could have been talking about me the past couple of weeks. As some of you might have guessed from recent posts, we've been house-hunting. It's hard to leave the house that's been home for almost three decades, but circumstances just seemed right to make a move. To make a long story short--something about which I know very little--we're now preparing to move within a couple of weeks. I'll try to post from time to time, but if you check the site and don't see anything new for several days, don't think I'm off playing golf or having fun. And I promise to be back with some worthwhile information fairly soon, including a couple of neat author interviews I have lined up. Meanwhile, enjoy what's left of your summer, and don't forget to write.